This deck is so versatile, it's like many decks in one! De'vo's playing cards have appeared on many television shows including Stan Lee's Super Humans television show! De'vo's cards are in the homes of celebrities and Hollywood superstars and used by magicians, card players and card artists around the world. Some of his decks sell out just minutes after release. De'vo created the world's first playing card deck for card flourishing, and the world's very first Cardistry decks! De'vo's special design concepts are groundbreaking and lead the world in functional design. De'vo has now taken his design genius to another planet with this LIMITED EDITION groundbreaker! 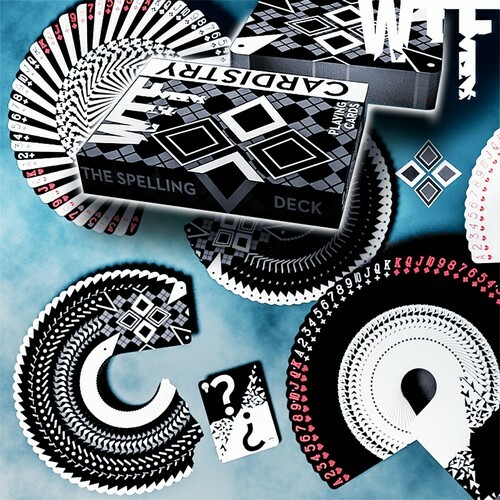 WTF Cardistry is a very specialized deck for card manipulators, cardists, magicians, XCMers and card collectors. This deck was designed to change its appearance depending on how it is manipulated and also was secretly designed to be able to SPELL almost any word! It can look like a WHITE DECK when fanned from left to right. A BLACK DECK when fanned from the other side. The cards are "reversible," allowing you to choose if you want the fan to look like a black deck, or white deck, or you can weave them into each other for some crazy results! The back design is De'vo's Twin Tip Signature design, allowing for multiple patterns depending on how it is fanned. As if all of this weren't enough, De'vo added something that has never been done on a "Cardistry" deck before! He secretly integrated a "Spelling" deck into the face design. This allows you to spell almost ANY word or sentence with just 1 deck as long as it doesn't have more than 2 of each letter. Yes, you are probably scratching your head right now like WTF??? - and to that we'd say EXACTLY! Unlike other spelling decks, this isn't just one big letter in the middle of the card -- there are letters flipped both ways so you don't have to worry about the direction. They are also white on one side and black on the other, allowing you to use the colors as punctuation, capitals, or to spell words inside of words. They are also off-set, so you can spread the cards over, which will shield the bottom letters, allowing much better reading of what you have spelled. IMAGINE being able to do card flourishing and manipulation and SPELL words as you do it! Or doing a magic trick and being able to spell out a spectator's card! There is also a Blank Shatter card, an exclamation point and a question mark for phrasing. There has NEVER EVER been anything in the card world with as much design and functionality as WTF CARDISTRY! The possibilities of this deck are endless! • Created by De'vo vom Schattenreich and Handlordz.